From diminishing snow and ice to increasing temperatures to rising sea level to more frequent and destructive extreme weather events, 97% of scientists agree climate change is happening and it is man-made. 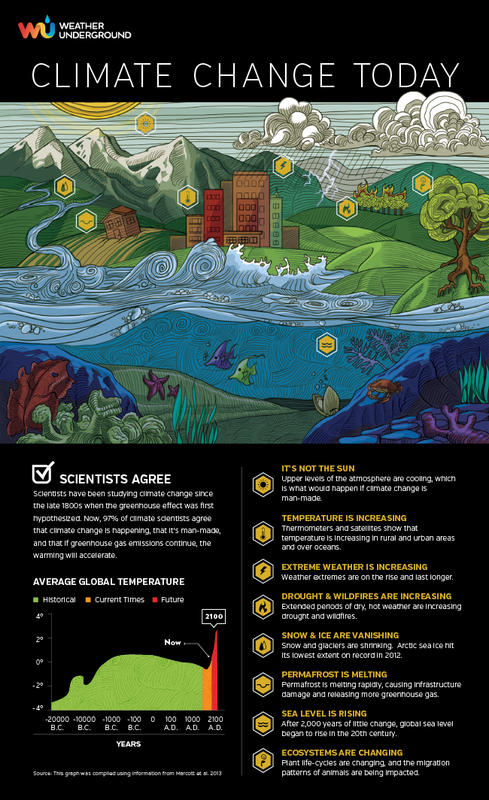 The Climate Change Today infographic by Weather Underground thoroughly describes these changes and how they are affecting the Earth’s ecosystems. If we continue on our current path, these trends are expected to accelerate. For information on tornado strength and damage, checkout this tornado infographic by Weather Underground. Get Away, Get Shelter, Get Low. How to stay safe in a tornado by Weather Underground. See proof of how the Earth is changing with these interesting facts in this infographic by Weather Underground.